Their fierce portraits stare out from cave paintings crafted by long-forgotten Stone Age masters. Their hooked beaks and deadly claws have adorned flags that led armies from Rome to Germany into battle. The spot on which one landed dictated to the ancient Aztecs the place where they were to build a city. Humans have long revered eagles. Eagles. For centuries, these seemingly larger-than-life birds have fascinated and inspired us. We venerate them as living symbols of power, freedom, and transcendence. In some religions, high-soaring eagles are believed to touch the face of God. Legend holds that Mexico’s Aztecs so revered the birds that they built Tenochtitlan, their capital, at the spot where an eagle perched on a cactus. Behind this extraordinary reverence, however, is the even more remarkable story of how Earth’s 59 species of eagles live their high-flying lives. 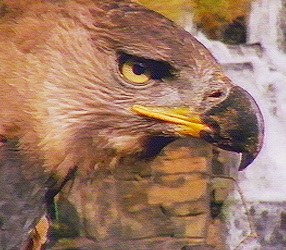 That story is told in the NATURE program Eagles, which gives a rare bird’s-eye-view of these masters of the sky. Eagles documents the stunning acrobatics and the ferocious hunting skills that have made these birds the nobility of feathered society, from the plains of Africa and the rivers of Alaska to the forests of the Philippines and the seas off Japan. When eagles come to mind, people commonly imagine some enormous hunter soaring above wide-open spaces on outsized wings. Indeed, eagles are among the world’s largest birds of prey. The largest, including the Harpy Eagle and the Philippine Eagle, can weigh more than 20 pounds and have wings that spread eight feet across. Using their massive, sharp talons, these giants can kill and carry off prey as large as deer and monkeys. But not all eagles fit this stereotype: some are just small balls of feathers content to flap short distances, dining on insects or even fruit. The Crested Serpent Eagle, for instance, is no bigger than a pigeon and spends its days walking and climbing through its African forest home in search of snakes. And the African Vulturine Fish-Eagle is primarily a vegetarian, eschewing meat in favor of rich oil palm fruits. Overall, scientists recognize four groups of eagles: The world’s 12 species of “serpent eagles” (also called “snake-eagles”) typically perch on trees and feed on snakes, frogs, and lizards. The six buzzard-like eagles are forest-dwelling giants, such as the Harpy and Philippine eagles, and prey on large mammals like deer. Eagles glide for hours at a time. The thirty “booted” eagles, so-called because feathers grow down the legs and cover the toes, include the widest-ranging eagle of them all: the Golden Eagle, which is found around the world and has learned to feast on an assortment of prey. 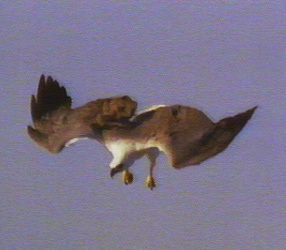 In Greece, Golden Eagles even eat turtles, dropping them from great heights onto rocks to break open their armored shells. The eleven sea eagles, which include America’s beloved Bald Eagle, tend to specialize in eating fish and water birds — some even hunt flamingoes and poisonous sea snakes. Biologists also recognize another significant difference among eagles: some are built to hunt in the tight confines of a forest, while others are designed to soar high above open plains and water with nary a wing flap. The forest eagles, such as the Crested Serpent Eagle, have short wings and long tails that enable them to twist and turn easily — an advantage when chasing prey at high speed through tree trunks and branches. In contrast, soaring eagles, such as the Golden Eagle and Africa’s Bateleur Eagle, have short, wide tails and broad, long wings that enable them to glide effortlessly on rising air currents. There is a tradeoff, however: soaring eagles tend to be poor flyers, making every takeoff and landing an adventure! As a result, soaring eagles often hunt from high perches, where they can literally “fall” into the air and swoop down on unsuspecting fish and mammals. Still, soaring provides an efficient means of covering ground — a necessity for eagles living in areas where food may be scarce. Golden eagles nesting in Wyoming, for instance, often have foraging areas that cover 100 square miles. To defend these territories and attract a mate, soaring eagles put on spectacular aerial displays. The airshows include death-defying swoops and seemingly suicidal dogfights — undertaken against both rivals and potential partners — that involve locking talons with the other bird and free-falling in a death spiral. The great American poet Walt Whitman, witnessing one of these breathtaking displays by Bald Eagles, described it as “a living, fierce, gyrating wheel,/ four beating wings, two beaks, a swirling mass tight grappling,/ in tumbling turning clustering loops, straight downward falling.” Sometimes, the dogfights end only when the great birds crash into a treetop or, in rare instances, one dies from hitting the ground. Eagles are known for their sharp vision. Usually, however, eagle eyes are too keen for the birds to fly blindly into danger. In fact, eagles’ vision is among the sharpest of any animal. Wedge-tailed Eagles, for instance, can see twice as far as people. Studies suggest that some eagles can spot an animal the size of a rabbit up to two miles away. In part, eagles have excellent vision because their eyes, which are very large in proportion to their heads, are densely packed with sensory cells. While humans typically have 200,000 light-sensitive cells per square millimeter of retina, eagles may have 1 million — five times more. 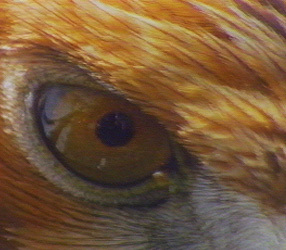 Similarly, while humans have only one fovea, a funnel-shaped part of the retina where vision is sharpest, eagles have two. Finally, where people see just three basic colors, eagles see five, enabling them to pick out even well-camouflaged prey. Unfortunately, even such remarkable traits have not protected eagles from harm. Around the world, many eagle populations are dwindling as a result of habitat destruction, hunting, and pollution. But conservation efforts are helping some species. In the U.S., for instance, the Bald Eagle has made a dramatic comeback over the last few decades. And on the island of Madagascar, the dramatic 1993 rediscovery of the Madagascar Serpent Eagle has raised hopes that its population also can be protected and restored. Thirteen Online is a production of Thirteen/WNET New York’s Kravis Multimedia Education Center in New York City. Dan Goldman, Executive Director, thirteen.org. Bob Adleman, Business Manager. © 1998 Thirteen/WNET New York. All Rights Reserved.